Half-legal (7" x 8 ½") comic book, 36 pages including outside and inside covers. Black scratchboard art on cream paper with parchment-colored cardstock cover. Published March 2011. 34 story pages illustrating in scratchboard the 1734 poem of the same name by eighteenth-century Anglo-Irish satirist Jonathan Swift. 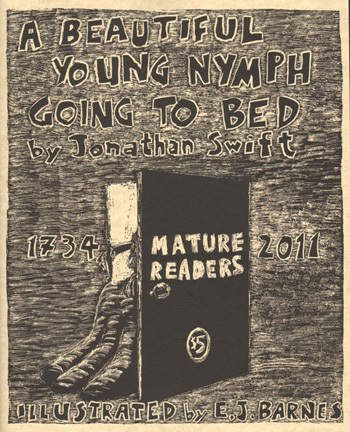 Text by Jonathan Swift (1667—1745); Art © 2011 E. J. Barnes. Describing the sad, nightly routine of an eighteenth century prostitute, Swift pulled no punches in these stanzas, which are likely jarring even to modern readers. Barnes' illustrations, reminiscent of woodcuts, are a perfect accompaniment to the words. EJ Barnes has captured the satirical venom and cynicism of Jonathan Swift's original work, and it is still as relevant as it was when it was published [in 1734].